After the second hearing of Pastor Andrew Brunson’s trial on May 7, 2018, a Turkish court ruled to keep him behind bars until the next hearing scheduled for July 18, 2018. The ruling came after a secret witness accused Brunson of helping a terrorist organization and planning to create a Christian Kurdish state. Reports claim that secret witnesses are testifying via a video link with their faces blurred and voices altered. Brunson’s lawyer said that when a case lacks evidence, ‘it’s kind of become the custom’ to use secret witnesses that have no credibility or link to reality. Three witnesses for Andrew’s defense were not permitted to testify on the grounds that they were also suspects in the case. “The truth is that this case is part of a larger decline in personal freedoms, including religious freedom and human rights, that we are witnessing in Turkey in recent years,” she said. “We are looking to the Turkish judiciary to uphold pastor Brunson’s innocence,” she stated. U.S. Commission on International Religious Freedom (USCIRF) strongly condemned a new indictment issued by Turkish prosecutors this week. 66 U.S. Senators and 50 Members of the European Parliament have sent letters to Turkey’s President demanding Pastor Andrew’s freedom. It’s very disappointing for the many hoping and praying for his release. Some may also be struggling with the reason his imprisonment is being allowed. However, we will not lose hope knowing our God is with Andrew and trust His plan for his future. Again, the Spirit of the Lord was on him to speak the truth clearly and have a good testimony during the 10 hour hearing. So glory to God and thank you for your prayers! It was very encouraging to have three members of USCIRF there, as well as Charge D’Affaires Phil Kosnett. Also, a number of believers and pastors, including from our home church. I know that meant a lot to Andrew. Unfortunately, the next hearing is not until July 18. So many prayers from so many places, so much fasting. This is not in vain. Surely a very big work of God is coming from this huge wave – really a tsunami – of prayer. THANK YOU! During his imprisonment, Andrew wrote a song calling ‘worthy of my all’. We would like to thank the ministry partners along with the many intercessors for participating in the 24 hour prayer conference call for Andrew Brunson. Much fervent prayer went up for our brother imprisoned for his faith in Christ. Also, heartfelt prayer went up for our persecuted family, worldwide. They who follow Jesus Christ and pay a high price. We believe our prayers were anointed of Jesus and ascended in the power of the Holy Spirit into the throne room itself. So again, a heartfelt thank you to the prayer warriors and ministry partners. Most importantly, we thank and praise our glorious God and King who made this call possible! Thankful He enabled us to unite together, as one family, and connect with Him on behalf of our brother Andrew and our persecuted brothers and sisters. Keep praying! 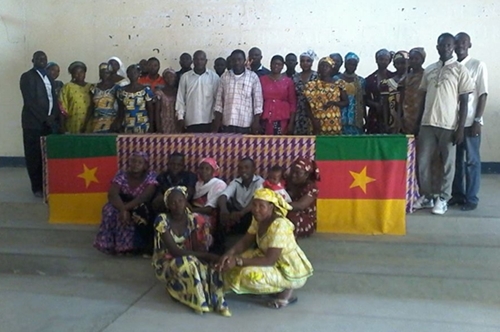 Thank you to the Prayer Team of a church in Maroua, Cameroon Africa who prayed as one with us by requesting prayer points during the Prayer Conference call for Andrew Brunson. Join the call to pray for the persecuted weekly!